The apple galette is sweetened with just a forth of a cup of maple syrup, and goes perfectly with a scoop of your favorite vanilla ice cream slightly melted on top. If you have any leftovers, enjoy it by itself for breakfast or an afternoon treat. The buckwheat flour adds a roasted note that works well the cinnamon, apples and maple syrup sauce. For the remaining flour, I like King Arthur’s gluten-free all-purpose blend because of the mix of flours, it measures cup-for-cup to standard flour and has no xanthum gum. You could use any flour of choice here, and certainly regular flour would work if you don’t have a gluten allergy. 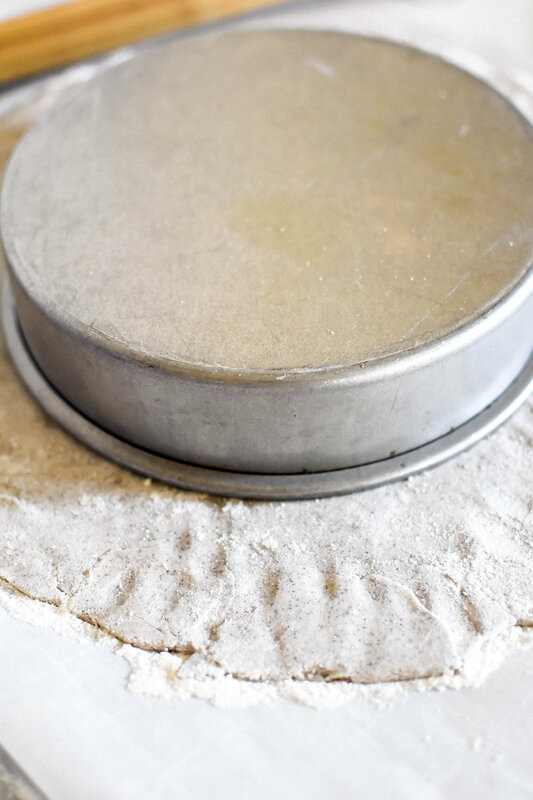 When rolling out the dough, flour your surfaces as well as the dough to help with any sticking. Otherwise it’s very easy to work with. If apples aren’t your thing, you could sub pears and perhaps add a nice crunch with some roasted walnuts or pecans. Please do share your alterations and experience with this recipe below in the comments section. Happy baking! In a medium mixing bowl, combine the gluten-free flour, buckwheat flour and salt. 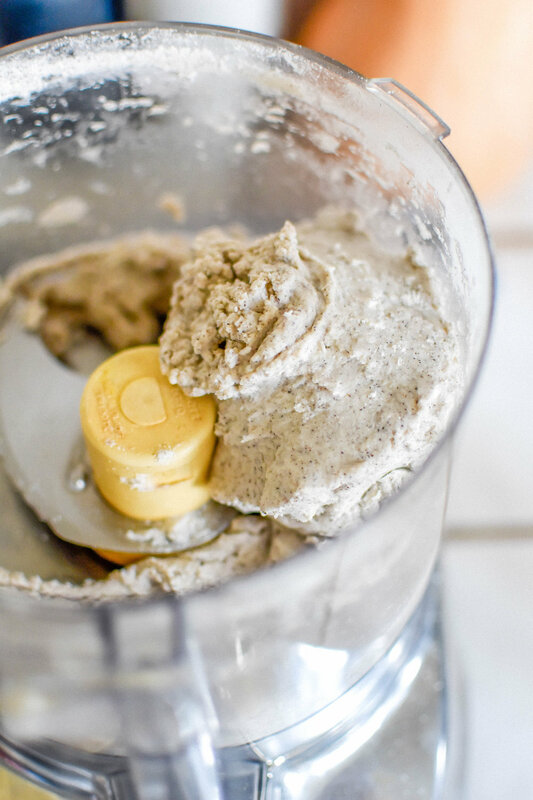 Stir together and transfer to a food processor. Cut the chilled butter into smaller pieces and add to the food processor. Have your ice water ready; pulse the flour and butter as you slowly add the cold water through the top of the food processor. The dough will eventually come together in a ball around the sides when it's ready. If it doesn't, add more cold water one tablespoon at a time. Using a spatula, transfer the dough back to the mixing bowl; cover and place in the refrigerator while you prepare the other ingredients. Preheat the oven to 400 F. In a small bowl or Pyrex measuring cup, whisk together the maple syrup, oil, cinnamon and nutmeg. Then, slice the apples into quarters, removing the core. Turn the apples quarters on their flat side, cut each quarter into very thin slices (try to keep them intact as you do so). Squeeze the lemon juice over the apples to prevent them from browning. 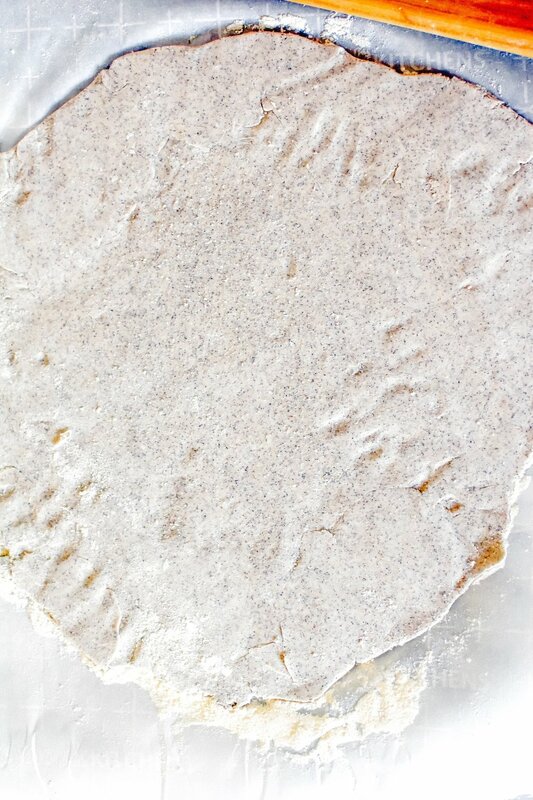 Next, remove the dough form the refrigerator and place on a floured piece of parchment paper on a flat surface. Roll out the dough into a rough circle, about 12-inches round. 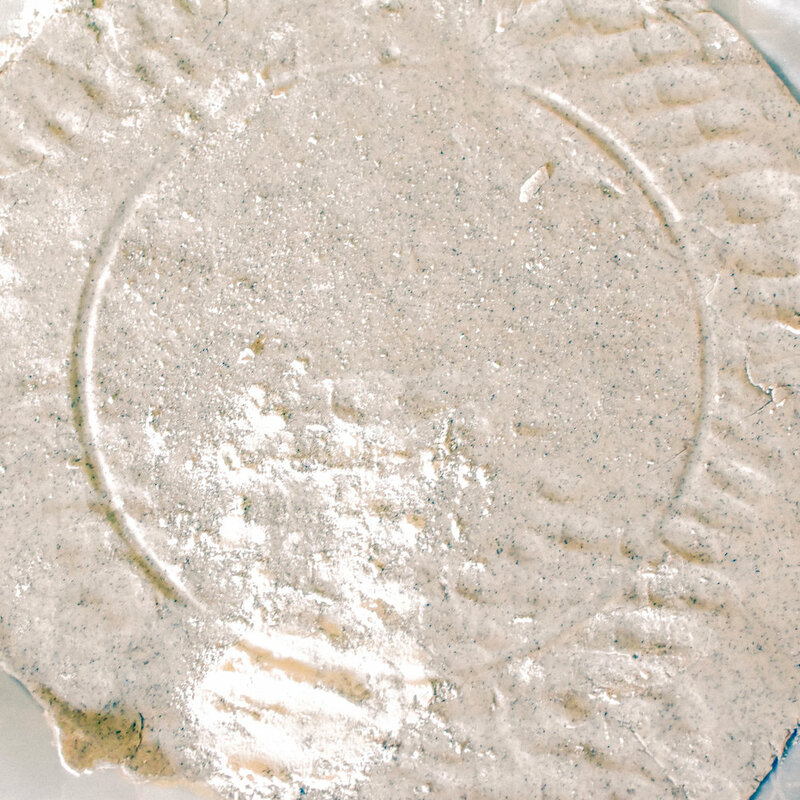 Transfer the dough, along with the parchment paper, to a baking sheet. If you have one on hand, use a 9-inch round cake pan to lightly imprint a circle in the middle of your dough. You will place the apples inside this circle. Altnernatively, estimate at least 2-inches of dough around the apples. Take each sliced apple quarter, fanning out the thin slices inside the galette; start from the outside edges and move toward the center. Do this in opposing directions with each sliced quater, in a crosshatch pattern. Use a basting brush to generously brush the apples with the maple syrup sauce. Then, fold the edges of the dough over the apples and (optionally) sprinkle with some coconut sugar. Bake on the middle rack of the oven for about 40 minutes, until the apples begin to caramelize and the dough is crisp and lightly browned around the edges; rotate the pan halfway through cooking. When the galette is ready, remove from the oven and allow it to cool for about 10 minutes. Dust with flakes of Maldon sea salt; slice and serve with your favorite vanilla ice cream. Store in an airtight container at room temperature for up to two days. I like King Arthur’s gluten-free all-purpose flour blend because I like the blend of flours, it measures cup for cup to standard flour and has no xanthum gum. You could use any flour of choice here. I have used olive oil in a pinch and it also works! The recipe is not overly sweet—it was meant to be served a la mode or enjoyed guilt-free for breakfast or an afternoon treat. Feel free to add more sweetener to the apple galette.